Is the Northern Lights Adventure a Good Fit for Me? 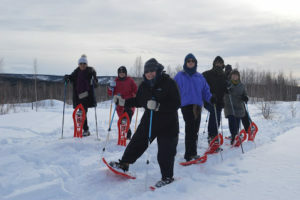 On our Northern Lights Ecotour we take your safety and comfort very seriously. Our transportation is spacious and well equipped to handle the winter snow and ice. Our guides are on hand to help guests in and out of the van and will help you avoid any snow or ice hazards. If you have trouble with stairs, just let us know and we will get you an easy access room. No issue is insurmountable – we are here to meet the challenge and show you the time of your life. Some people come to us and they say “I’m from California/Hawaii/Mexico etc…I don’t even own a winter coat”. Well don’t worry about it, you don’t need to spend a bunch of money! Our lodges usually have heavy duty winter gear like jackets, boots and pants available in a variety of sizes. This stuff is true Alaskan gear so you don’t have to worry about freezing while you are enjoying activities like watching the Northern Lights or dogsledding through a snowy forest. If your size is not available at the lodge we can get you in touch with a local rental company. We will keep you warm so you can enjoy your adventure! Gondwana offers something really special on this trip that other companies don’t. Every night you will be taken care of by our “Aurora Guide”. That way you won’t have to stay up all night and you can rest for your fun activities the next day. This person is primarily there to watch the skies and provide personal wake up calls when the Northern Lights appear. But that is only a part of their job. When making your way outside they can assist you in getting to the prime spots for seeing the Northern Lights. And once there, they will bring you a tea or hot cocoa to keep you warm. Our Aurora guides are also photography experts, so bring your camera manual along and they will help you figure out the best settings so you can come home with incredible photographs. After bringing you to dinner, your night guide will be available until the early morning hours. This makes all the difference on a Northern Lights Adventure. 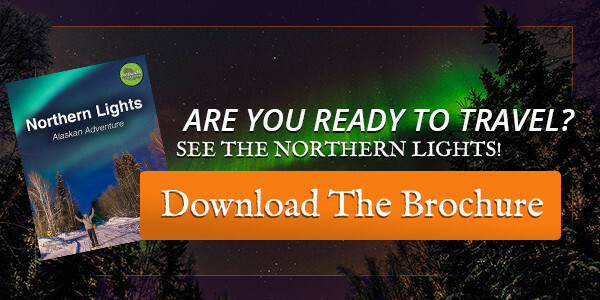 Our trip is not just about seeing the Northern Lights, there is so much more fun to be had! Our activities can be enjoyed by just about anyone. Curling is so much fun, and if you have trouble getting down on your knees we have a pusher you can use while comfortably standing. If you are concerned about being able to play well, don’t worry! Everyone starts off poorly at this unfamiliar sport, and that is part of the fun! Laugh as your new friends attempt to be graceful on the ice and work up your skills until you can compete in a casual game with each other. Our selection of activities is great for older folks and any level of physical fitness or mobility. Visit a local family farm, meet the family and the animals and learn about homestead living. And relax in the healing waters of Chena Hot Springs. If you would like to sit an activity out there is always a warm place indoors for you to relax, socialize and watch. 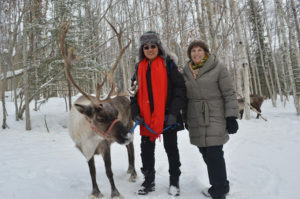 Our hike at Running Reindeer Ranch is fairly easy, but if you want to take a break Jane’s cozy living room has tea and hot cocoa and home made cookies. 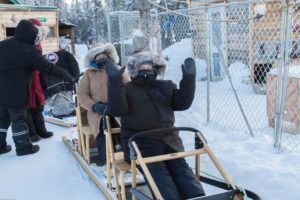 If dogsledding is not your thing, relax in the yurt nearby and hear about epic races from your host. There will always be options for you on our Northern Lights Adventure where you can still learn and enjoy the atmosphere, even if you are not participating. 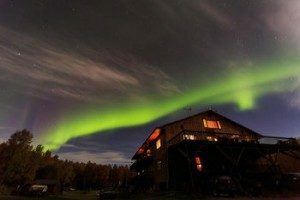 At our lodges there is always prime Aurora viewing right at your doorstep. Either step onto your attached deck or take a few steps outside to get fantastic views and photographs. If you need any assistance getting outside from your room we will be there to help you. We stay 20 minutes away from the city at A Taste of Alaska Lodge and Alaska Grizzly Lodge so the light pollution from downtown doesn’t affect our views. And sometimes we will even take a drive after dinner up to the top of a hill where you can enjoy a bird’s eye view of the city and a complete 360 degree view of the night sky. While our lodges are conveniently within reach of the city, you are surrounded by pristine forests and mountains and you get a true sense of what it feels like to live in the Alaskan wilderness. Look out for moose on your way in and out of the lodge! Worried about the cold at night? Just a few steps from A Taste of Alaska Lodge is a heated yurt (circular tent cabin) with a wood stove, couches and plenty of space to relax. Since the aurora can go on for hours and there can sometimes be gaps in between light displays, this yurt is a great option for staying comfortable at night while not missing any viewing opportunities. Kick back and read a book, or sip on a hot cocoa or tea while you wait for the lights to come out. We also have lounge areas just steps from your viewing deck at Alaska Grizzly Lodge. Feel like taking a break from the activities, or socializing with new friends during a free afternoon? 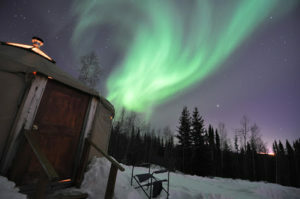 Our lodges have fantastic common areas to enjoy views, read a book or entertain yourself in comfort and Alaskan style. A Taste of Alaska has incredible vistas over the forest to the Alyeska mountain range and on a clear day you can see Denali. The luxurious living room at Alaska Grizzly Lodge features bearskin rug decor, a fire place, games, and even guitars that you can play. 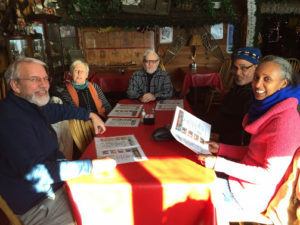 What a great way to relax in between activities, hang out with other travelers and get to know your hosts! 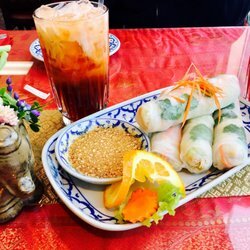 We have carefully selected our meal options to provide you with a variety of cuisines as well as menus with vegetarian and vegan options. Enjoy the risotto at Lavelle’s Bistro, the spring rolls at Bahn Thai or the vegetable lasagna with sun-dried tomato cream sauce at the Pump House, and there will always be salads available at dinner. While Alaskan menus are not known for their vegan or gluten free options, we can help to accommodate any type of dietary needs. We are here to make your Alaskan experience perfect.